The war started! You are the commander of the Battleship Pew Pew and need to destroy the waves of enemies who want to destroy the planetary shield of your world! To each destroyed enemy the chance of the galactic alliance survive increases. But be careful! Every living enemy, the planetary shield of their home world is weakened! 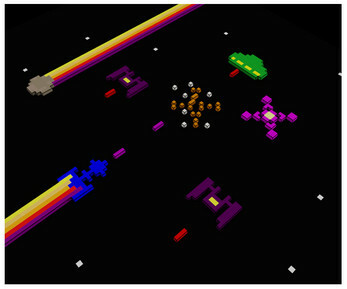 Battleship Pew Pew is a shooter with a retro look similar to the old Atari 2600 games. In this demo to be played in the browser, there are four game levels. Our complete game has infinite phases, more than 10 different enemies, power ups and a series of small surprises. This game is the first of our future pack, called Atari Dream. Released version supports Gamepad and keyboard! Mac version are on the way!